Buhbo Cat 6 Slim patch cables have 3mm diameter cables compared to standard 5.8mm diameter cables. Optimze the data center and rack space with thinner cables. Also great in residences when trying to keep a low profile. Cat6 Ethernet patch cable made with UL Listed CMR Type PVC Jacket for high bandwidth of up to 550 MHz. 30 AWG stranded bare copper wire and a 50-micron gold plated body RJ45 plug provides universal connectivity. Supports up to 10 Gigabits per second, performance designed for high speed data transfers for servers, cloud computing, LAN, high definition video, network adapters, hubs, switches, routers, DSL/Cable modems, and patch panel. 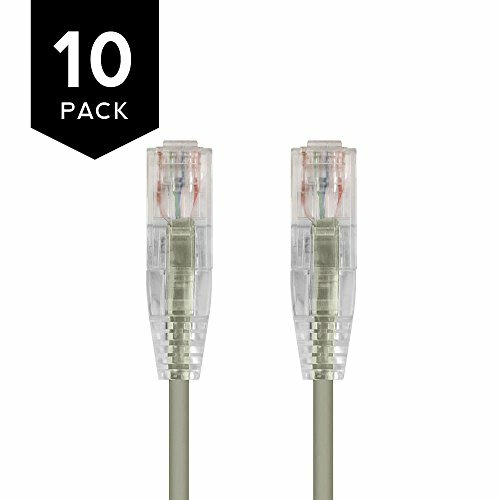 The category 6 ethernet patch cable is backwards compatible, but exceeds the performance or Cat5e cables. Future proof your network for practically the same price of Cat5e.